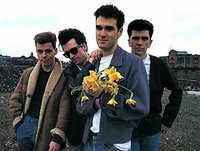 Song: "Reel Around The Fountain"
Briefly: If push came to shove, I would proudly proclaim that The Smiths are the second most important, influential, and relevant rock band of the 80's after the Pixies. 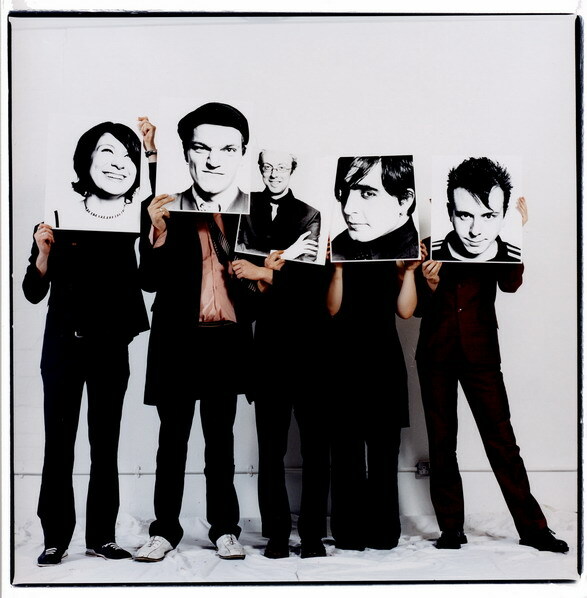 Their influence on the last two decades of British and American alternative/indie rock music is incalculable and incontestable. Since the demise of The Smiths, their lead singer, Morrissey, has maintained a rather successful solo career that has probably overshadowed what has proven to be The Smiths' greatest and most enduring asset: Johnny Marr's wholy unique guitar style. Johnny's guitar playing is sometimes over-simplified and described as "jangle-rock", but, his playing was never that simple - his complexity as a musician was just subtle and deceptive. The Smiths had a traditional Jaggers/Richards division of labor - Morrissey wrote the lyrics and Johnny wrote the music. Johnny's clean, fluid style was hyper-melodic, but, he served the rhythm first and foremost. He could churn out a galloping vibrato guitar line that was equally rockabilly and Velvet Underground. Why: "Reel Around the Fountain" is the first song on their first album. The song that introduced the world to The Smiths: a wire-taut rhythm section, an unassuming guitar hero, and a singer with a fey, yet, masculine voice. In my opinion, it is a perfect introduction to the band and their aesthetic, and, it is an epic - clocking in at almost 7 minutes. "Reel Around the Fountain" is a delicate tale of lost innocence whose lyrics tend to be vague and ambiguous (as most of Morrissey's lyrics were). On a sidenote, the Built to Spill song "Virginia Reel Around The Fountain" is a direct homage to The Smiths and this song. 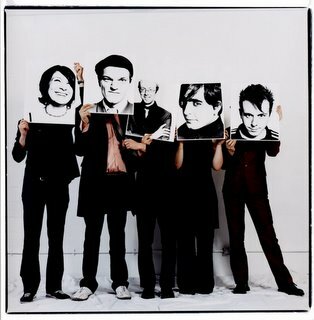 Besides Built To Spill, many of my other favorite bands have claimed The Smiths as a prominent influence: Radiohead, The Arcade Fire, Belle & Sebastian, The Magnetic Fields, Pulp, The Verve, etc. Also, in one of the most exciting surprises in recent memory, Johnny Marr is currently collaborating with Modest Mouse's Isaac Brock on new songs for the forthcoming Modest Mouse album!!! ...because I want to go to all of them. Last summer, I went to Intonation and one day of Lollapalooza-- both for free, both backstage, and both because they were in Chicago. To be honest with you, I'm not sure I even like festivals unless I have VIP access. Not because it's hot and outdoors, but because you have to sit through a lot of crap you don't want to hear, and it's hard to get remotely close to the best shows. That said, I would still go to Coachella and Bonnaroo. Performances I would like to see appear in bold. Depeche Mode, Franz Ferdinand, Sigur Ros, Common, Damian Marley, Atmosphere, Carl Cox, My Morning Jacket, Ladytron, Clap Your Hands Say Yeah, Tosca, Cat Power, Animal Collective, Hard-Fi, Derrick Carter, Devendra Banhart, She Wants Revenge, The Walkmen, The Juan Maclean, Audio Bullys, Imogen Heap, Lady Sovereign, Deerhoof, The Duke Spirit, Editors, stellastarr*, Lyrics Born, Matt Costa, The New Amsterdams, The Zutons, Platinum Pied Pipers, White Rose Movement, Chris Liberator, Colette, Joey Beltram, Hybrid, Wolfmother, The Like, Living Things, Nine Black Alps, The Section Quartet, Infadels, Youth Group, Shy FX & T Power, Infusion. The first day of Coachella is definitely stronger overall, but there are still a ton of things I'd like to see on the second day. Tool, though? Seriously, Tool? Why? That's the best they could do to headline the second day? Yipes. Oh well, that would just give me an excuse to get a head start on traffic. Radiohead, Tom Petty and the Heartbreakers, Phil Lesh and Friends, Beck, Elvis Costello & The Imposters, Bonnie Raitt, Death Cab for Cutie, moe., Bright Eyes, The Neville Brothers, Béla Fleck and the Flecktones, Buddy Guy, Damian Marley, Ben Folds, Robert Randolph and the Family Band, Dr. John, Matisyahu, G. Love and Special Sauce, My Morning Jacket, Ricky Skaggs & Kentucky Thunder, Steel Pulse, Mike Gordon and Ramble Dove, Cat Power, Medeski Martin and Wood, Nickel Creek, Gomez, Atmosphere, Steve Earle, Blues Traveler, Amadou & Mariam, Stephen Malkmus & the Jicks, Dresden Dolls, Son Volt, Clap Your Hands Say Yeah, Jerry Douglas, Soulive, Rusted Root, Devendra Banhart, Donavon Frankenreiter, Mike Doughty, Sasha, Grace Potter & the Nocturnals, The Magic Numbers, Bill Frisell, Seu Jorge, Bettye LaVette, Dungen, Shooter Jennings, Rebirth Brass Band, Robinella, Andrew Bird, Steel Train, Jackie Greene, Devotchka, Wood Brothers, dios (malos), Toubab Krewe, The Motet, Marah, I-Nine, Balkan Beat Box, and Cat Empire. More to come. Well, it's hard to beat Radiohead, but aside from a handful of other cool bands, it's mostly jam band garbage. That's fine, that's what Bonnaroo has always been about. At least those hippies will be exposed to some other, more interesting music. The one thing I'll give the jam band kids is that they often use it as a springboard to liking more interesting music. I know plenty of Phish-fans-turned-indie-dudes. That said, thank god Widespread Panic isn't on the bill. Ugh. We should find out about Glastonbury and all of the European festivals in the next couple montns, as well as the remainder of the American shows. Since I'm moving to Minneapolis soon, I hope and pray that this year's 10,000 Lakes Festival will expand beyond jam bands. Please! At first I had trouble connecting with Art Brut because I felt the material was too jokey, too clever for the sake of being clever, that they were a novelty act. Not true at all. The songs are strong, as well as being both sincere and honest. The humour isn't pretentious. I recently came across these acoustic performances recorded by frontman Eddie Argos last October. These versions demonstrate the strength of the songs-- that Art Brut isn't about catchy guitar hooks and stylized post-punk nonsense. The lyrics can without a doubt hold their own, and Argos uses a gentler voice here. It's still very, very British, but it's also warmer. Here, "Rusted Guns of Milan" turns from self-depricatingly funny to self-depricatingly tender and emotional. Also, check out the great, Pixies-esque "These Animal Menswear", which isn't on the album. In retrospect, Art Brut put on what was arguably the most entertaining and fun live show I saw last year. Go see them if they come to your city or village, you won't be disappointed.